Zhongshan Soccer Stadium, Chungshan Soccer Stadium, or Taipei Soccer Stadium (Chinese: 中山足球場; pinyin: Zhōngshān Zúqíuchǎng) is a multi-purpose stadium in Taipei, Taiwan. It was established in 1923 as Maruyama Stadium (圓山運動場) during the Japanese rule. The soccer stadium is opened in 1989, it was reconstructed from the former site of Yunshan Baseball Ground (Chinese: 圓山棒球場) under the guidance of then Chinese Taipei Football Association President Chiang Wei-kuo. 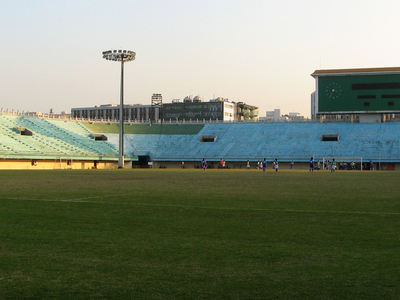 Although it was built as a soccer-specific stadium, it is mostly used for live concerts or other activities due to lack of professional football league in Taiwan. The stadium is able to hold 20,000 people for football games and 40,000 for concerts. It is now managed by the Hope Foundation led by former athlete Chi Cheng. 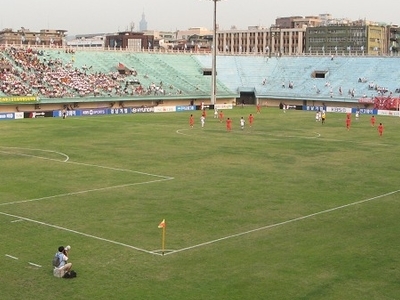 Zhongshan Soccer Stadium locates in Zhongshan District, Taipei City, at the cross of Yumen Street (Chinese: 玉門街) and Minzu West Road (Chinese: 民族西路). Nearby is the Yuanshan Station of Taipei Metro (Tamsui Line, Red Line). The stadium is accessible within walking distance South East from Yuanshan Station of the Taipei Metro. Here's the our members favorite photos of "Stadiums near Zhongshan". Upload your photo of Zhongshan Soccer Stadium!